For more photos, click here or on any photo. If you go to Dry Lake east of the village of Marlbank, you can swim on marl beaches. The marl is a gray, clay-like substance meant to be good for your skin. You can have a fine swim while smearing marl all over your body. 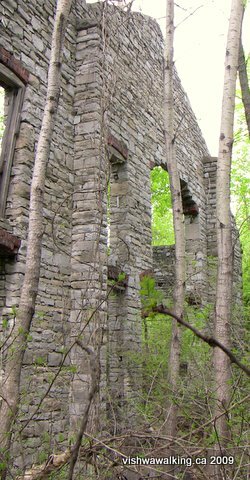 Remnants of the old cement factory are on the northeast side of the lake beside Marlbank Road (County Road #13). The history of the Marlbank cement factories on the Internet, is confused. Here's how I have pieced the story together. It is contradictory. One version: In 1891 the Canadian Portland Cement Company started operations in Marlbank. It was owned by Edward Wilkes Rathbun, who owned extensive operations throughout the country. Marlbank is reputed to be the first place portland cement was produced in the country (see a footnote on page 306 from The Federal Court of Canada: A history, 1875-1992). "According to the 1905 Report of the Ontario Bureau of Mines, the first portland cement in Canada was produced by Rathbun’s company in 1891 'after five years of experimental manufacture,'" reads the copy in the listing of Rathbun in the Dictionary of Canadian Biography Online. But, according to the Canadian Encyclopedia, "Canadian production [of portland cement] began in Hull, Qu�bec, in 1889." To sum up: We have either the English Portland Cement Company or the Canadian Portland Cement Company developing portland cement in Marlbank. Either Butchart or Rathbun or Hopper were the first to produce portland cement in Canada — or someone in Hull Quebec..
Perhaps there is a confusion of plants. In the history of the Federal Court of Canada cited above, page 306, note 52 it says: "The Canadian Portland Cement Company was itself a 1900 merger, capitalized at $1.5 million, of the Rathbun Company's plant in Deseronto, Ont.,the Beaver Portland Cement Company's plant in Marlbank, Ont. and the Canadian Portland Cement Company's two plants in Marlbank and Napanee Mills, Ont. Canadian Portland Cement's operation were soon rationalized and concentrated in Marlbank. Rathbun started his plant in 1891, which may have been called the English Portland Cement Company. Hopper was probably around too, although I'm not sure in what capacity (see below). Here's an excerpt from the November 10, 1898 Tweed News, as retold on the Marlbank : "The Tweed News carried an interview with Mr. Hoppner (sic) of the firm of R.T. Hoppner and Company, mineral dealers of Montreal . Mr. Hoppner announced that the Montreal company had bought stock in the Marlbank works and that the works would be re-opened and extended. The Tweed News explained that the works had been closed for some years, although a large amount of money had been spent." Perhaps the Beaver Portland Cement Plant and Rathbun's Marlbank plant both operated out of Marlbank. One of them may have been closed for the bulk of the 1890s, which accounts for Hopper (misspelled as "Hoppner" in the above account) stepping in and getting involved in 1898, or reopening a plant he had started earlier. When companies merged, confusion resulted. Whatever, happened, it seems clear that the Canadian Portland Cement Company was born in 1900 out of the above-mentioned mergers. Rathbun's companies were largely situated in small communities; the merger meant that headquarters moved to Toronto and the consolidated companies were in the hands of large financiers. Wilmot Deloui Matthews was one of those financiers. In 1909, financial problems across the industry forced sellouts and mergers. Matthews sold Canadian Portland (and kept an interest in it) and it mutated into a new firm, Canada Cement. One of the new owners in this deal was William Maxwell Aitken, better known as Lord Beaverbrook. But other cement plants, better equipped and closer to water and easy transport, outstripped Marlbank. The cement factory closed its doors somewhere between 1909 and 1911. The cement plant in St. Anne, just east of Belleville was particularly blamed for the Marlbank plant's closure..
At its height the plant employed 200 people. After the plant closed, the population of Marlbank dropped from about 1,000 to 200. The train tracks were taken out in 1941. Here's another mystery: Above I dismissed Robert Hopper somewhat. 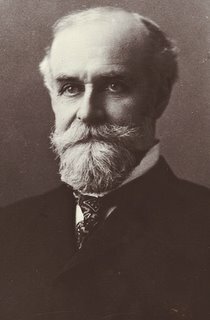 However, in the Canadian Library and Archives Canada, there is a reference to Irwin Hopper and Co. of Montreal (the company Robert took over) in 1890 "desiring police protection at their cement works near Marlbank on the Kingston, Napanee and Western Railway." I have to confess that there are all sorts of enticing loose ends like this mixed with shoddy research on the Internet. The amount of incorrect information on this one issue is depressing. I trust I haven't added to the rubbish. I hope someone can get to a library, check out the documents and write a definitive history of the Marlbank cement factories before it is lost in the mists of time. The cement factory remains are on the northeast side of Dry Lake, east of the village of Marlbank on Marlbank Road. There are "Private property" signs posted. To really see the ruins, you have to wander in from the road a bit. Be careful: there are ditches to fall into and patches of poison ivy to avoid. It's hard to imagine 200 people working here; there must have been more buildings (wooden ones?) that have totally disintegrated. How to get there: From Highway #37 just south of Tweed, go 22 km west on the Marlbank Rd. From Napanee, go 18 km north on Hwy#41, then 5.5 km north-west on County Rd #3.